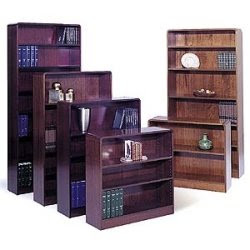 These are Radius Edge Wood Veneer bookcases from Diversified Furniture. The distinctive radius edge lines of these bookcases and their rich looking finish will enhance any office decor. Handsome cases have solid one piece all veneer backs. DFI (Diversified Furniture Industries) was founded in 1979. Their mission is clear; to import and distribute the finest quality wood veneer desks, bookcases, computer furniture and storage products at value minded prices. In addition, Diversified Furniture Industries is excited to proclaim their new lines of wood seating, laminate bookcases and storage products overwhelming success in 2003. They travel around the world to bring to customers the best possible wood and laminate products that the world has to offer. Their desk collection, bookcases and wood veneer storage products hail from a first class factory in the country of Slovenia. Their line of wood seating is produced in Italy, by a family owned and operated factory that is concerned with attention to every detail While the country of Brazil is home to their ever expanding line of laminate bookcases and storage products.